HomeSouth IndiaSabarimala - Why Kerala is protesting women entry. 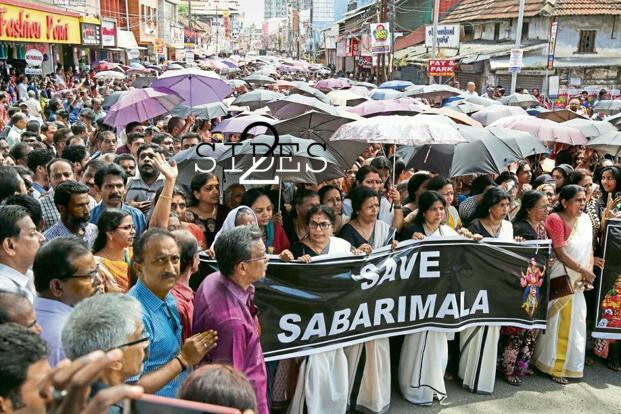 This article is about the reasons why the people of Kerala are protesting the entry of women to Sabarimala. To read the flip-side, click here. Ever since the August 2018 verdict by SC allowing women entry to the Lord Ayyapa temple at Sabarimala, Kerala has been a tinderbox. Attempts by so-called activists to 'visit' the shrine had been met with stiff resistance of the devotees, and except for the duo of Kanakadurga and Bindu who waged (and staged for the media) a midnight guerilla tactic to scale the holy peak, all others had been stopped in their tracks and sent back. The 2nd January escapade by the two women led to a statewide shutdown. Right and left wing forces clashed throughout the day on 3rd January in different districts, leading to riot like conditions and imposition of prohibitory orders. There have been at least two confirmed casualties in addition to the hundreds injured and loss of property during these clashes. At least a section of the national media has portrayed the developments in Kerala as a backlash of male patriarchy against female empowerment. Headlines celebrated the 'historic win' when the acharalankhanam -literally, breaking of tradition- happened. This is a blatant misrepresentation of facts. First and foremost, denying women of reproductive age entry to Sabarimala is not an example of discrimination. Women are free to enter as long as they are under 10 years of age or over 50 years of age. Women in the prohibited age group help those undertaking the arduous trek prepare for it, espcially mother and sisters of the devotee who are involved in every step of prepration incuding packing the irumudiketu for Lord Ayappa. Further, even transgenders and those women who are physically incapable (such as those women who have had their uterus medically removed) are allowed to visit the shrine. This is purely an age-old tradition intertwined with the history and mythology of the temple. Lord Ayyapa at Sabarimala is an eternal celibate, and the story of how he fought a demon and brought back tiger milk for his sick mother is known to almost every child brought up in Kerala -irrespective of caste, creed or religion. Or gender. It thus follows that any women in the age group 10-50 attempting to scale the shrine is a non-believer, and when they are doing it, it is only for the sake of attention or for proving a point. Moreover, a majority of the women who attempted to climb to the shrine in the aftermath of the SC verdict neither kept the 41 day penace observed by devotees before cimbing Sabarimala, nor did they carry the holy irumudikettu which contains offerings for Lord Ayyappa. Thus, these attempts were but a direct assault on the collective consciousness of the masses who believe in the deity. Comparisons to the abolishment of untouchability and tying the core issue down to 'purity' of menstruating women is again unfair. It must be understood that the Sabarimala tradition is not a systematic subjugation of a section of the population with malicious or unethical intent; it is but harmless custom and faith. Such practises, which can be over-zealously classified as misogynous discrimination, are present in all religions throughout the world. A simple google search will give a list of temples within India where tradition is that men are denied entry. When viewed against this backdrop, the vilification campaign against the Sabarimala tradition is both myopic and hinduphobic in nature. The tantri(priest) at Sabarimala closing the temple and enacting a cleansing ritual when news broke of the women entry had also come in for harsh criticism. It is the duty of the tantri to adhere to the deity's wishes and when an aberration to that happens, it once again is his duty to take action to rectify the harm done to the traditions and beliefs at the temple. Misrepresenting it as a general statement against women equality in Kerala is but malicious hypocrisy. It is but willful ignorance of the fact that Kerala, one of the few matrilineal societies in India, has consistently ranked among the top states in the country in almost all parameters of women empowerment, education and equality. Claims of deeply ingrained patriarchy are thus but a superficial reading of the situation in the state with no true understanding of the facts and ground realities. Kerala Chief Minister Pinarayi Vijayan's tearing hurry to implement the SC verdict by any means necessary is one of the main factors that led Kerala to the state it finds itself in now. In the last bastion of the communist party in India, the help and encouragement given to activists to scale the holy peak even before the SC ruling comes in for review on January 22 is seen as a blatant attempt to push party politics in the garb of social reform. The popular perception is that the CPI(M) led LDF is trying to keep the Hindu community politically rudderless in order to halt the growth of right-wing organisations in the state. The 'Women's Wall', stretching along the length of the state on January 1, was done through coercion and misuse of government machinery for political gains. The fact that acharalankhanam happened the very same night as this activity in propaganda was adding insult to injury. Kerala is no stranger to social reform and has been at the forefront for abolishing discriminatory practices for almost a century now, right from the Vaikom Satyagraha in 1924. The Sabarimala issue, however, is not about social reform, it is about safeguarding tradition, history and identity of a temple, and protecting the sanctity of a diety millions believe in. The Lord Ayyappa's shrine is close to the heart of most Hindus within as well as outside of Kerala, and Malayalis are justified if they do not take lightly to the arrogance of a few in power to play politics with this emotional issue.